If you’ve ever fractured a bone, you fully understand how miserable the experience can be. In some cases, you even hear the bone when it cracks, which is both shocking and disconcerting. Then the shooting pain sets in and the inability to move the injured body part. Other times, the injury progresses gradually, and you don’t even realize that there’s a problem until you feel the pain of the fracture. Regardless of which experience you identify with, fractures can leave one feeling frustrated: about the pain, the inability to do simple tasks independently, and the interruption of job, sports, and hobbies. But not all fractures are created equal. Sometimes they’re caused by trauma; while other times they’re caused by repetitive movements or an underlying disease that weakens the bones. Treatment and recovery time varies depending on the type of injury. What are the Different Types of Fractures? This is the type of fracture that occurs when an injury causes the bone to break clean, with its parts in alignment. This means that the bone maintains its original position. 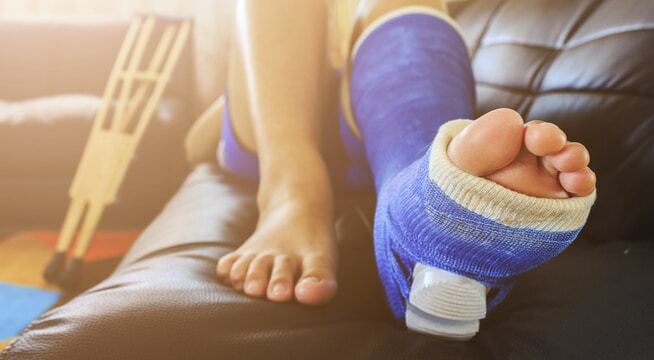 Treatment for a Stable Fracture: Since this type of fracture doesn’t require realignment, the doctor will simply immobilize the bone with a cast. The patient can take over-the-counter anti-inflammatory medications to alleviate pain. A transverse fracture is one that occurs at a 90-degree angle, straight across the bone. It happens when the impact comes perpendicular to the site of injury. Treatment for a Transverse Fracture: The medical provider will realign the bones through an open reduction internal fixation(ORIF). Once the bone fragments are aligned, a traditional cast or splint will be used to immobilize the bone. A comminuted fracture leaves the bone in fragments. It is most common after severe trauma, such as a car accident, and is more likely to occur in the hands or feet. Treatment for a Comminuted Fracture: Due to the bones being fragmented, this type of fracture requires surgery in order to prevent additional damage to surrounding organs, nerves, ligaments, arteries, and veins. An oblique fracture occurs when the bone breaks at an angle. It tends to occur most often on long bones, such as the femur or tibia. This type of injury causes a visible deformity beneath the skin. Treatment for an Oblique Fracture: Treatment varies depending on the severity of the injury. If it’s a minor fracture, conservative treatment (such as immobilizing the bone with a cast) will suffice. However, there are instances when the bones need to be realigned and surgery is required. This is one of the most severe injuries: A compound or open fracture is when the bone pierces the skin when it breaks. Surgery is usually called for due to its severity and the risk of infection. Treatment for a Compound Fracture: This type of injury is an emergency. More likely than not, the patient will require surgery to clean the area, remove debris, and stabilize the fracture. The patient will need a tetanus shot and antibiotics. A hairline fracture is also known as a stress fracture and occurs mostly on the legs and feet. It is a result of repetitive movement and occurs when athletes suddenly increase the frequency or intensity of workouts such as running or jogging. Symptoms include pain when participating in your sport of choice; pain that subsides when resting; swelling, tenderness, and bruising. Treatment for a Hairline Fracture: The most important thing you can do to heal a stress fracture is rest. Take time off from exercising. Depending on the severity of the injury, your doctor will recommend a specific resting timeframe. Also, ice the injury site for up to 20 minutes at a time, several times a day, and keep the foot or leg elevated. An avulsion fracture is a break at the site where bone attaches to a tendon or ligament. When this happens, the tendon or ligament pulls off a part of the bone it’s attached to. Treatment for an Avulsion Fracture: Surgery is not necessary for most avulsion fractures; unless the detached bone fragment ends up at a significant distance from the bone. The medical provider will instruct you to rest and ice the injury and will recommend specific range of motion exercises. In a Greenstick fracture, a portion of the bone breaks but not completely through. The injured bone may also bend near the broken portion. This type of injury is most common in children. Treatment for an Avulsion Fracture: If the bone is bent, the doctor will manually straighten it. And the patient can wear a removable splint as opposed to a cast. This happens when a bone is wrenched by the forceful rotation or twisting of a limb. It results in a clean break where the bone completely breaks into two fragments. Treatment for a Spiral Fracture: The healing process for a spiral fracture is more complicated than other types of fractures because the twisting motion results in jagged edges on the bone. Surgery is required in most cases to realign the bones and set them back in place with screws, pins or rods. Post surgery the patient will wear a cast and undergo physical therapy before returning to their regular activities. Pathological fractures occur when a patient has an illness that has weakened their bones, such as osteoporosis, arthritis, osteomyelitis, osteosarcoma, or metabolic bone disorders. Treatment for a Pathological Fracture: Treatment will depend on the underlying condition that caused the fracture. If the illness doesn’t affect the bone’s ability to heal, the patient will only need to wear a cast to immobilize the limb. If an illness has compromised the body’s ability to heal, surgery will be necessary. If you’ve suffered a bone fracture, we can provide the care you need. If you have questions or need immediate treatment, your nearest Complete Care location is ready to help, no matter the time of day or night. We offer a variety of services to help you and your family in your time of need. No appointments are necessary. Find the Complete Care location nearest you. © 2019 Complete Care. All Rights Reserved. Complete Care recognizes the importance of ensuring that our website is accessible to those with disabilities. Complete Care strives to adhere to the accepted guidelines and standards for accessibility and usability. To that end we have recently reviewed our entire website to identify non-compliant elements or documents and to bring them into compliance. We are continuing this process to ensure that the site remains up-to-date regarding updated guidelines. We are continually seeking solutions that will bring all areas of the site up to the same level of overall web accessibility. In the meantime, should you experience any difficulty in accessing the Complete Emergency Care website, please contact ITSupport@Complete.Care.